What a difference a day makes. Last week they were Masters of the Universe, smugly in control of the nation's levers of power from their metropolitan fortress, safe in their armour-plated Jags. Today Clegg is toast, a has-been, a zombie, a member of the walking dead. His manifest dishonesty and his loyalty to Brussels rather than to Britain have finished him. He'll be lucky now to get a TV debate with the Greens. Cable will probably step in to deliver the gladus blow to the neck, but he will pick his moment. On Wednesday the MSM was united in Hate for Farage. How fickle those chip-wrappers are! Today it's Miliband's turn; it's 'Good on yer, Nigel!' today but 'Blunders that made Mr Weirdo unelectable' for Ed. Even the Grauniad recognises that his party have put Miliband 'on Notice'. And Sam Cam is probably thrusting pins into a Theresa May doll in the flat at No 11; with impeccable timing she has given Plod a kicking and seen Hooky jailed, and not one of the failed projects hidden by Downing Street can be laid at her doorstep. All it needs is for St Theresa to release the text of a letter to the PM pledging her unswerving loyalty for us to be sure that she's declared her candidacy for Cameron's job. Charles Moore blames London - which has 12.5% of the population but 20% of Labour's members. "It is true that Ukip supporters are very concerned about immigration, but for the most part their animus is not against immigrants themselves, but against this occupying army of the powerful in central London. In particular, voters have come to see all the three main parties as no more than different brigades in the same force." concludes Moore, about three years behind the rest of us. And the pain isn't over yet. We have all day on Bank Holiday Monday to relish with exquisite shadenfreude the discomfort piled on discomfort as the Euros are announced. I recall Viviane Reding's insufferable arrogance as she hectored us at the Royal Institution in February. I hope she's following our results. Enjoy, all. No, I didn't stay up all night, but what with Radio 4 taking over the World Service and the summaries on the news sites, it's pretty clear what's been happening. Grant Shapps has vowed that there will be no pact between UKIP and the Conservatives for the 2015 election, but voters have made him eat his words at Council level as Tories have lost control of key Councils and will need to work with new UKIP Councillors to govern. That will mean at least some cabinet-level jobs for UKIP Councillors - and a training-ground for future UKIP MPs. I suppose the one comfort is that Cameron has promised there will be no pacts with UKIP, making such pacts a virtual certainty. I remember my first term at mining school in Doncaster asking a pub landlady for a roll and just for a second she thought I was making an indecent proposal before pointing me to a selection of cobs. I soon learned to call cabs taxis, and generally got things right except for one night at Donny's only nightclub, Juliets (no apostraphe) when I approached a lass who looked 100% home counties, all gymkhanas, teeth and poise - for her to respond in pure south Yorkshire "Is thy not whaerm? I'm fair sweating, me". I offer the foregoing to explain that I understand fully why uber-geek Miliband cannot connect with Labour voters north of Stamford. Labour is the London party that screwed the economy and flooded Britain with immigrants. And for anyone who knew how deeply and pervasively the NCB pumped the blood in the veins of local communities - an NCB apprenticeship being the equivalent of a grammar school place, and a pit deputy's job being about as middle class as you could get - the Tories are still about as popular as Satan. No one is going to pretend that overnight UKIP will change from a mass of excited cats to a disciplined party structure. Before the week is out, electoral success will have brought resignations, party switches, schisms and rows, all of which will be seized upon by the MSM with glee. But the job has been done; yesterday the British people did not what was logical, calculated or advantageous but what was a resounding blow for democracy, a reminder to the entire political class and its dags of the power of the ballot box. The winner is not UKIP but the British people. Let's celebrate this as a beautiful dawn. We've always known that politicians on the continent were bent - that European power politics always was a filthy, stinking dungheap of crookedness, corruption, fraud, bribery and gerrymandering - but in the UK we have also somehow convinced ourselves of our own immunity from it all. In a hard-hitting piece, leftie academic Perry Anderson (H/T Peter Oborne) gives us a full essay in the London Review of Books exposing in ghastly forensic detail the sewer that is Italian politics - and why Beppe Grillo's 5 Star is set to collect so many votes tomorrow. Worth persevering with, even if sections are hard going. Perry is making the point that the EU, rather than tending to be positively influenced by the best and most virtuous practice on the continent, is overwhelmingly contaminated by the worst and most corrupt, and that this filth leeches back to infect and contaminate national politics. Just by our membership of this putrescent club, the UK has become as foul and stinking a den of political corruption as the worst in Europe. Take Abu Hamza out of the mosque and put his inflammatory rhetoric before ordinary decent people and he's exposed for what he is - a rabble-rousing nihilist careless of human life taking full advantage of our Western freedoms and liberties. Until now. This loathsome creature has now been rightly convicted of truly dreadful crimes and will now rightly die in a US prison. Many are asking why we couldn't try him here in the UK, and I'm sure the answer will be complex - but a large part of it must be the operation of the Human Rights Act, the actions and proclivities of the ECHR and an unfounded fear that we may somehow upset Muslims in the UK by jailing a brutal killer. Our law and that in the US are closer to each-other than either system is to the dreary Napoleonic Code of Europe. Let's build on that difference - and teach a lesson to all the would-be Islamic terrorists sheltering in Europe that that Britain is not a comfortable place for them. David Cameron has just promised tougher measures to tackle Islamic terrorists. So that's the kiss of death to any positive changes, then. Fears that the traditional rules of golf will be changed in the event of a UKIP victory were dismissed today by the party's Sports and Media spokesperson who said "We have absolutely no intention of changing the rules of bloody 'goff' - I don't even play the game"
The poor LibDems, at the nadir of their political fortunes, sans members, sans votes, sans money and with only the ministerial Jags of their top-dogs to add credibility to their claim to be a national political party could probably use an endorsement from Chris Huhne about as much as the NHS could use healthy living advice from Doctor Harold Shipman. But Huhne has damned them nonetheless, asking Guardian readers to vote for people with his values. Rather than for candidates who exhibit honesty, probity and truthfulness, presumably. Perhaps Labour, too, can be assisted in this way; how about endorsements from Elliot Morley, David Chaytor, Eric Illsley and Jim Devine? Or a Tory ad featuring Lord Hanningfield? Or Jackie Smith marketing a Labour DVD under the strapline 'You won't need tissues'? Perhaps they're just going for the ex-lag vote, all the rest having deserted them. 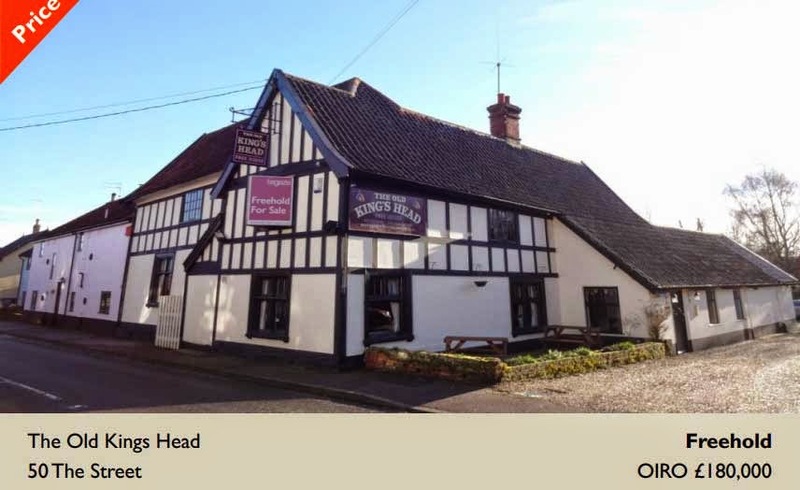 One property sector that shows no sign of quick improvement is the freehold pub market. Every morning another 'price reduced' flyer lands in my email inbox; one such is this Grade II listed timber framed historic Anglian house, with land including a car park for 30 vehicles, just seven miles from Diss - now within commuting distance of the City. You couldn't even get a bedsit studio in Neasden for this.